DOUBLE. 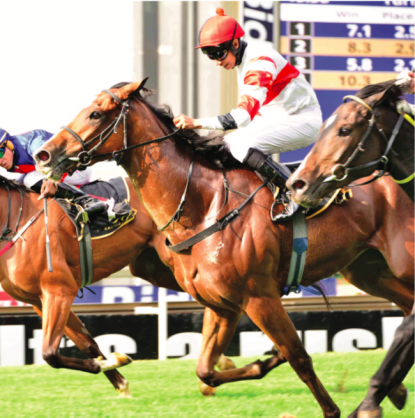 Gambado in Race 7 could be the start of a quick double for Piere Strydom at the Turffontein Inside track on Sunday. Strydom should score a quick double aboard Evolver in Race 8. If Royal Crusade was lining up for Race 7 at Turffontein on Sunday he would have been a short-priced favourite. Gambado has form which puts him very close Royal Crusade yet he is priced at 4-1 for this MR 88 Handicap over 2000m on the Inside track. Gambado was well beaten by Royal Crusade the first time they met but in the Listed Sea Cottage Stakes which was won by Majestic Mambo, Gambado finished 1.20 lengths behind Royal Crusade who ran second. They met again in the SA Derby over 2450m at Turffontein at level weights and this time just 0.45 lengths separated them. Prior to that Gambado came out to win the Listed Derby Trial over 2000m on the Standside track. The form looks strong and the fact Gambado has raced three times in feature-race company indicates he could have an advantage over the rest of this field. The fact he has won his only race over 2000m adds to his chances and they have been given a further boost with the knowledge Piere Strydom takes the ride. In addition, he jumps from barrier No 1. The only concern is that this will be his first run on the Inside track but the positives should out-weigh an issue that might not be a problem at all. Only two other runners look likely to trouble Alec Laird- trained Gambado and they are The Rising Legend and Kremlin Judgement. The two met last time out with The Rising Legend flying up late under Callan Murray to win going away over 1800m on this track. This time Kremlin Judgement has a 1kg pull and on paper that should be enough to turn that result around. However, Geoff Woodruff’s charge came from well behind De Kock’s runner to win going away and this extra 200m should be right up his street. He has only run five times and must have much more room for improvement. Nevertheless, Kremlin Judgement is rarely far behind the winners and his day cannot be far off. For the Exotic bets one need not look beyond these three runners. Strydom could have a quick double with Evolver in Race 8, a MR 68 Handicap over 1800m. He rides the three-year-old son of Gimmethegreenlight for Ashley Fortune and the manner of this gelding’s last victory over course and distance in his penultimate run should make him a hard horse to beat in this field.